Press Conference, New York, 20 September 2011 Ahead of the United Nations General Assembly week this 19-23 September, The Elders announce that they will visit New York to highlight one of the most neglected issues in development: child marriage. MEDIA ADVISORY – Archbishop Desmond Tutu, Dr Gro Brundtland and Mary Robinson will draw global attention to the neglected issue of child marriage during the United Nations General Assembly week in New York, 19-23 September. Girls Not Brides: The Global Partnership to End Child Marriage, initiated by The Elders, will be presented on the world stage for the first time at a press conference at the Clinton Global Initiative in New York on Tuesday 20 September. The Elders will also speak at a number of other events (see below). Each year, an estimated 10 million girls are married worldwide before the age of 18. That's more than 25,000 girls a day who are robbed of their rights and their childhood. Child brides usually drop out of school. Their health is put at risk – girls under 15 are five times more likely to die in childbirth than women in their 20s. Girls Not Brides, a new global partnership to end child marriage, brings together dozens of international NGOs and grassroots organisations from every corner of the world. Girls Not Brides will give greater visibility and leadership to the issue of child marriage and strengthen efforts to end it at local, national and global levels. Press Conference with Archbishop Desmond Tutu, Mary Robinson and Girls Not Brides partners (11:45 am, Tuesday 20 September, accreditation required). 'Addressing Child Marriage' with Mary Robinson and Dr Gro Brundtland (10:30 am, Thursday 22 September). 'Every Woman Every Child': Reception hosted by UN Secretary-General Ban Ki-moon, with Archbishop Desmond Tutu, Mary Robinson and Dr Gro Brundtland (20 September). The Social Good Summit: 'We are stronger together: the transformative power of human connection' with Archbishop Desmond Tutu and Mary Robinson of The Elders (3:30 pm, 21 September). MDG Countdown 2011: 'Celebrating Successes and Innovations', a DFID/USAID event with Archbishop Desmond Tutu and Mary Robinson (4pm, 21 September). 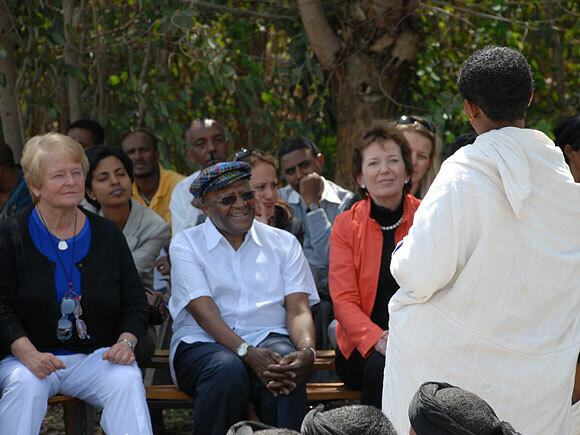 Elder Gro Brundtland blogs from Ethiopia about visiting Berhane Hewan, a project that educates girls, their husbands, their families and their community leaders about the risks of child marriage.